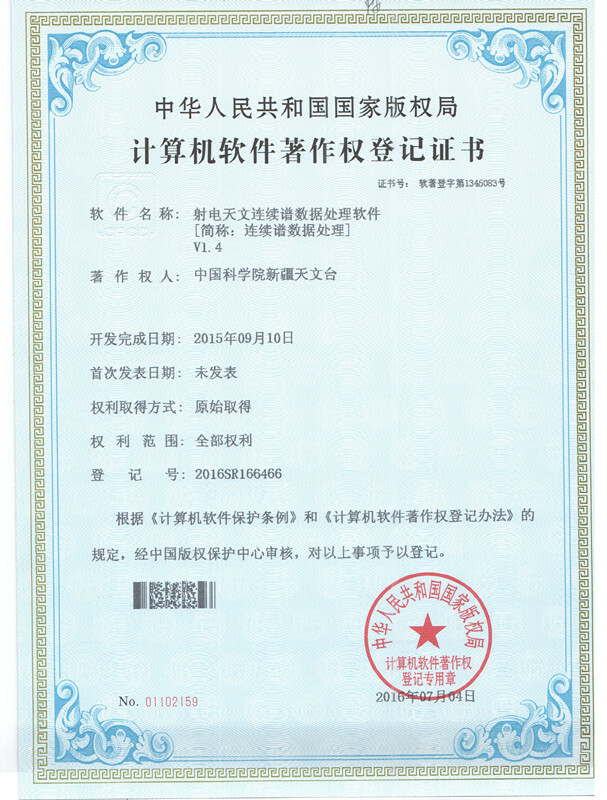 Recently, Jun Liu and his“Radio astronomical continuous spectrum data processing software V1.4” has been awarded the “Computer Software Copyright Registration Certificate” by National Copyright Administration of the People’s Republic of China. Computer Software Copyright Registration No. 1345083. Radio astronomical continuous spectrum is an indispensable observing mode in radio astronomy, which is used to measure the radiation intensity of celestial objects in certain radio frequency range. Along with improvement performance of observing hardware and increasing demand in science needs, the radio astronomical data tends to increase massively . In order to meet big challenges on traditional data processing methods, under the leading of the group supervisor, Xiang Liu , cooperating with Lang Cui and other researchers, Jun Liu complete the software system. This system provides a complete range of observational data processing scheme on continuous spectrum data of single aperture radio telescopes. And it has main features like fast speed, high accuracy and friendly UI. Its main function includes data monitoring, data viewing and processing, and supports data processing mode like off line/real time, command line/GUI, manual/production line to meet various subjects needs. Besides, this system will automatically and quickly assess the performance of radio telescopes, which provides foundation for follow-on automatic antenna measurement.